Giant Tiger – Thames Lea Plaza collect money for their “Someone’s Angel This Christmas” event each year. In 2016 the staff collected a total of $3,000.00 for Chatham Goodfellows “No Child With a Christmas” campaign. Last year the staff collected almost $10,000. This year over $16,000 was collected. Giant Tiger and staff were the Chatham Goodfellows 2018 President Award recipient. They were recognized for their long-term support for Chatham Goodfellows. In 2017 Giant Tiger’s manager, Mark Lush and his staff made a monumental commitment to Chatham Goodfellows to support the Chatham Goodfellows “Boot Program” which had been dormant since 2013. Last year the soft re-introduction of the “boot program” was a success. This year Chatham Goodfellows are pleased to announce that the “Boot Program” is continuing with a significant enhancement. This year each child will receive a Giant Tiger boot and shoe certificate. The money collected during the “Someone’s Angel This Christmas” event, and the $12,000.00 donation from the “100 Plus Women Who Care” will be used for the Chatham Goodfellows “Boot and Shoe Program”. 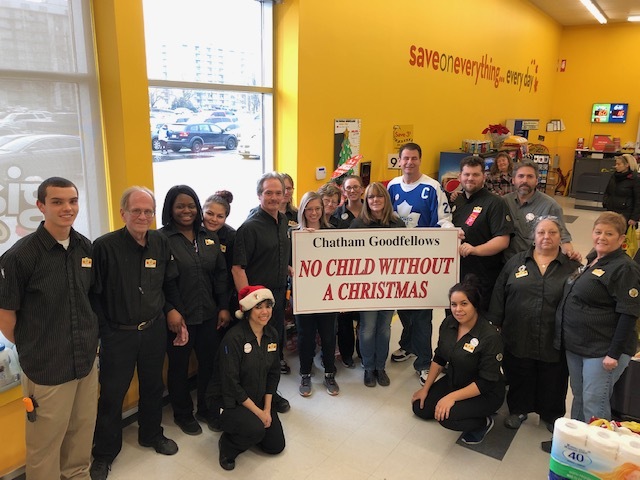 In the photograph Mark Lush and his great staff at Giant Tiger celebrate raising over $16,000.00 with Chatham Goodfellows President Tim Haskell. – Toy Delivery date is Monday, December 17, after 5:30. – Street Sales are being conducted on Friday, December 14 and Saturday, December 15. – Food packing is at Spirit and Life Centre (St. Joseph Site), packing/delivery on Tuesday December 18 – packing beginning at 8am – deliveries beginning at 11:30 am.